History of the successful Czechoslovak bomber squadron in the RAF during WW2. No. 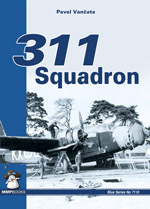 311 (Czechoslovak) Bomber Squadron was established as the second Czechoslovak combat squadron within the Royal Air Force during the summer of 1940, and became the only wholly Czechoslovak bomber squadron in the RAF. The Czechoslovak pilots flew Wellingtons and B-24 Liberators on operations, and returned to their homeland with the latter at the end of the war. The book contains superb colour illustrations of camouflage and markings, rare b+w archive photographs. Essential reading for aviation enthusiasts, historians & scale aeromodellers.